Clipmaker allows users to compile clips from different videos across a selection of folders into Working Clip Reels. Working Clip Reels can then be saved as Saved Clip Reels that can then be exported as different media file formats like .mp4, .mp3, .mov, and .wmv. 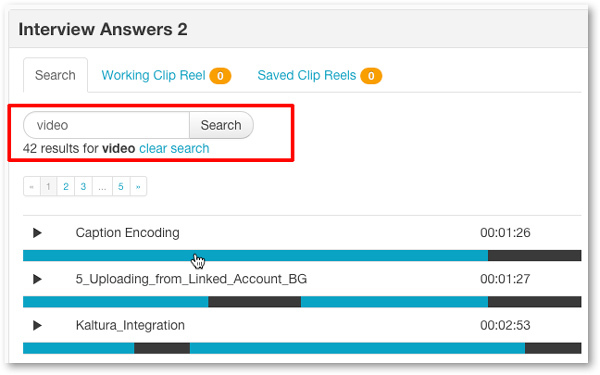 This article explains how you can search across your Clipmaker project to create clips. If you need to create a new Clipmaker project, you can see more information on creating a new clipmaker project here. Once you have launched Clipmaker, use the Search function to search words within your content across an entire project or an individual transcript. The image below shows a search for the word "video" within all files included in the clipmaker project. Within this project, all of the instances of the word "video" in your transcripts are highlighted blue and the number of search results are listed below the search bar. Click on the blue highlight and the selection will expand displaying the clip with the search results as seen below. Click Clip to add this clip to your Working Clip Reel. The image below shows a search for the word "file" within the active transcript. The highlighted white dots on the timeline represent the search results. You can jump to that exact point in the transcript by clicking on these dots. To create clips from the transcript, highlight the text you want to include in the new working clip reel and click the Scissors icon. To preview and search a different transcript from your collection, click the Play icon next to the file you want to load. As you click Add to Clip Reel you will see the number of clips listed in Working Clip Reel tab at the top of the page. The example below shows that we now have (3) Working Clip Reels. To create another Clip Reel, click on the Project Files tab and repeat this process.